Don't Throw Away That Jar! 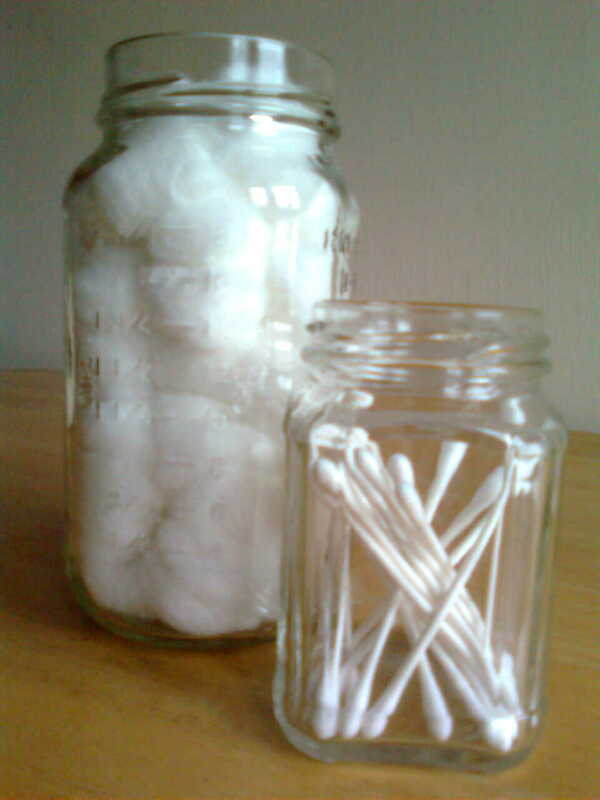 How cute are glass jars... seriously, I think they're adorable. Not to mention they come free whenever you buy marinara, or jam, or salsa, or pretty much any pre-made sauce ever... Growing up I was accustomed to throwing away/recycling these jars, and one day it just hit me... What the hell am I doing throwing these away, and then spending money buying receptacles for things? It's ridic, is what it is... Now we've all seen them used as lemonade glasses at country style establishments (Roadhouse Grill? ), but what we don't realize is that the very jar that holds your BBQ sauce can make a really pretty vase. Just follow some simple steps. I used an old pasta sauce jar for the cotton balls, and a lemon curd jar for the Q-tips. I'm also using some in the kitchen, to make a quick salad dressing, to keep sugar handy, and as drinking glasses, of course. I use them to hold pencils and paint brushes, to organize odds and ends, and to make little terrariums. Worry not, I'll be posting more on those terrariums futurely. Every day I find some new use for the jars I've kept. So stop throwing those jars in the recycling bin, and start soaking them in some hot water, you'll never have to buy a toothbrush holder again! but the walls you'd built around it. But I think we're afraid to trust this, we're afraid the fountain will run out, and we won't have anymore. Not for ourselves, not for others. So we carefully build a dam around all that goodness. We fortify it. We watch it very carefully, not letting anything (or anyone) that might compromise its structure get close... And not letting anything out either, keeping it all encased in concrete and stone. I know this is a somewhat convoluted analogy, but stay with me. And then, something you didn't prepare for happens: someone dies, or you feel some new human's fingertips on the back of your hand... you look up and... BAM. There goes the dam. Your brain (aka the dam operator) screams, "This wasn't in the training video! WE HAVE NO PROTOCOL!" So the dam bursts. It crumbles... and all that wonderfulness you were jealously guarding comes flooding out, in tears or in laughter... sometimes both at the same time. This isn't a bad thing! This is, in fact, the best thing ever. You get to be open again. You're broken, you feel destroyed. You think to yourself, "There's this giant hole inside me now, and I can't control my feelings anymore." Good! There is a giant hole inside you, and if you stop trying to fill it with alcohol and day-old pizza, it will fill back up with love and yeses, and even flow out of you. The way it was always meant to be. Crying is good, laughing is good, any feeling in general is awesome, and right. So feel away, and stop trying to frantically rebuild that dam... 'cuz honey, it's unnatural, and it's bound to break again. If you're lucky enough to recognize this dam-breaking as it's happening, you'll notice for that moment in time, you were simultaneously as powerful, and as fragile as you'll ever be. That's the yumminess right there. What if our hearts don't need protecting? What if we were to just let emotion flow in and out... What if we didn't try to control it so much? If we loved freely (damless), maybe the possibility of pain wouldn't be so scary. Because we'd realize it's only temporary, that the good stuff always wins out. If we let it. Feelings won't kill us, even if it feels like they might. Once you look that scary feeling right in the face, you'll see that it can't hurt you. It can only teach you something vitally important about yourself. No one ever learned anything from looking away. Not such a big deal that you're out of coffee now, is it? So smile, and make some tea instead. It's the truth, I can prove it!